You and your horse both need riding time, so don't let worries about exposure to insects interfere with what you love most. One of the reasons we love to ride is for the "escape" factor. Time in the saddle is the perfect antidote to forgetting--if just for a while--the worries and problems of life. Ironically, that cherished time with our horses in the great outdoors can come with a few concerns of its own. According to the Centers for Disease Control and Prevention (CDC), the number of illnesses caused by mosquito, tick, and flea bites in the United States more than tripled between 2004 and 2016. And that's just considering illnesses that affect humans. Horses are also at risk for insect-borne disease, such as West Nile virus, Eastern and Western equine encephalomyelitis, Lyme disease and others. You and your horse both need riding time, so don't let worries about exposure to insects interfere with what you love most. Farnam's Dual Defense™ Insect Repellent for Horse & Rider protects both you and your horse, so you only need one bottle of repellent. Dual Defense™ Insect Repellent for Horse & Rider provides long-lasting 12-hour protection from mosquitoes that may transmit West Nile, chikungunya, dengue, and Zika viruses, and ticks that may carry Lyme disease, plus 8-hour protection from a variety of biting flies, chiggers and Scottish biting midges. Picaridin, the EPA-registered active ingredient in Dual Defense™ Insect Repellent for Horse & Rider, is known for efficacy. "Not only can this well-known active ingredient be used on the whole family, it also provides great repellency for horses at the same time. You can use it on your children, as well as your horses to protect them and you don't have to keep reapplying it," notes Tina Anderson, Director of New Product Strategy & Development - Equine for Farnam. "Not only can this well-known active ingredient be used on the whole family, it also provides great repellency for horses at the same time. You can use it on your children, as well as your horses to protect them and you don't have to keep reapplying it". 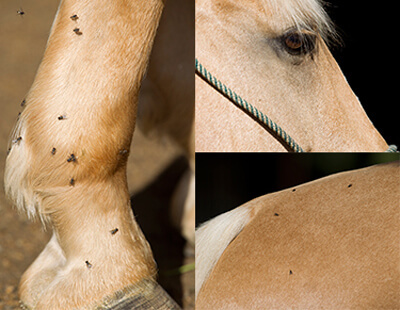 Now you don't have to remember to bring along one insect repellent for yourself and another one for your horse. Dual Defense™ Insect Repellent for Horse & Rider has you both covered--and in the best way possible. That's because Farnam utilized the new EquiVeil™ 360° continuous spray bottle to simplify the application process. Unlike standard aerosol and trigger bottles, the EquiVeil™ 360° continuous spray bottle sprays at any angle, even upside down. This makes it easy to protect hard-to-reach areas, including under the horse's belly and inside the back legs. Simply shake and spray for a fine, even mist that provides uniform coverage for the best protection. "The packaging of this product is just as great as the product inside," says Anderson. "Once you've tried it on yourself, you'll realize it really works.". Dual Defense™ Insect Repellent for Horse & Rider isn't greasy or sticky on your skin or your horse's coat. You don't have to worry about this colorless spray damaging leather tack or synthetic materials. Now you can use one product to protect your horse and eliminate his fretting about biting pests so he can relax and focus, and at the same time free your own mind from concerns about insects that may transmit dangerous disease. Farnam even backs up the product with a "satisfaction guaranteed or your money back" promise. With Dual Defense™ Insect Repellent for Horse & Rider, you can quit worrying and keep riding. That's a win-win for both you and your horse. Dual Defense and Equiveil are trademarks of Farnam Companies, Inc.